Palekh is situated in 65 km to the east from Ivanovo town on the bank of the Paleshka-river, which flows among the hills covered by leaf-bearing forests. Before the Revolution Palekh was on the territory of Vladimir province. 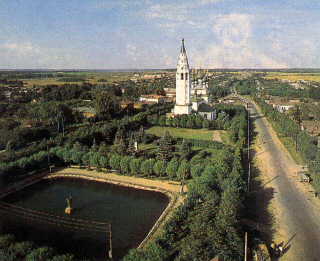 In 1918 it was attributed to Ivanovo-Vosnecensk province. In our days it is a settlement and a district centre of Ivanovo region. In ancient time this land belongs to Vladimir-Suzdal principality. According to a legend Palekh was founded by the people from Vladimir and Suzdal escaped from tatar-mongol invasion. They burnt the forest and built a settlement named Palekh. But it is only a legend. In reality the place was named after the river Palekh (later on Paleshka). Nobody knows now what the word means. The word came from the language of the tribe lived in the place and spoken the unknown language like some other names as Landekh, Lylekh, Lukh. Now Palekh is a part of a tourist route "The Golden Ring of Russia". You can go there from Moscow by bus from Tsholkovo bus-station or by train up to Ivanovo and then from Ivanovo bus-station up to Pestyaky, Putchezh or Yuzha through Palekh.